Fair warning: below, I reveal the general plot, summary and characters within issue three. 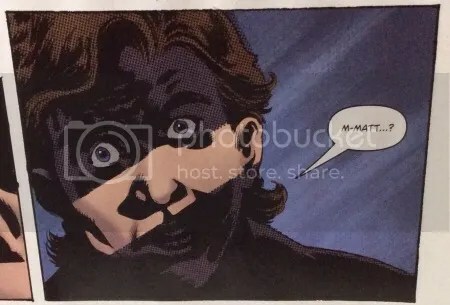 Issue 3 of the new 6 book mini-series by Wein and Jones came out this week and I’m still processing how I feel about where the series stands now that we are at the halfway point. I get into the weeds in this post so please bare with me. As this series progresses it leaves me with a number of questions and curiosity. The artwork, as always, is stunning. I can’t say it enough, Jones does Swampy justice like very few artists can. 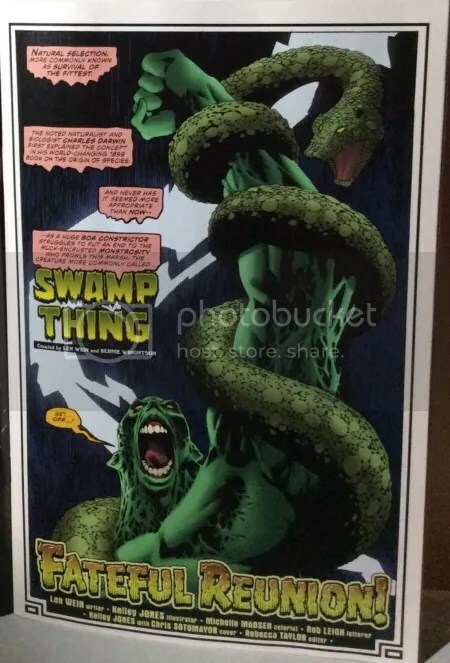 Depicting Swamp Thing in the horror genre, Kelley Jones is second only to Bernie Wrightson. I hope these books are reprinted in black and white someday so I can endlessly gawk at his intricate linework and the depths of his shadows. Matt Cable is back in the picture! He and Swampy catch up and there is a really tender moment as they reunite. My face lit up when I read this string of panels at the bottom of the page. Cable explains, since they last saw each other, he transferred to a new FBI unit. 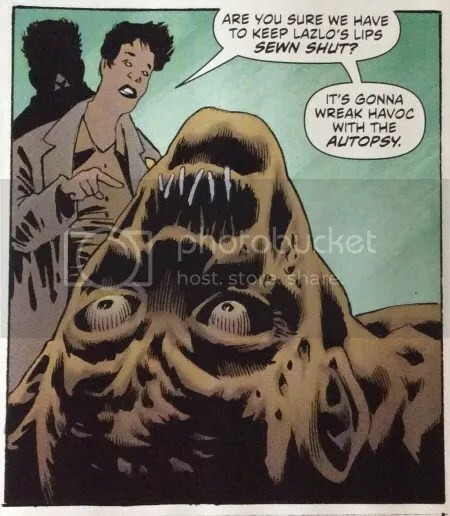 In series 1, the last time Cable saw Swamp Thing was in issue #20 The Mirror Monster, in which Cable and Abby thought Swamp Thing was killed. 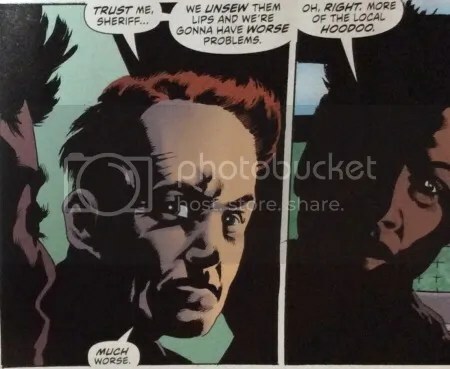 In series two, #17-19, Cable explains that after #20 (series 1) he tried going back to work with the government but they tortured him with electroshock therapy to erase his mind and all knowledge of the Holland case. After the shock treatments, Cable went on the run. He eluded the government who sought him out, resulting in a dramatic descent into alcoholism and depression. My long-windedness and the panels below leads me to believe that this guy may not be Cable after all. But, I certainly don’t claim to have it all figured out. Wein and Jones made it quite clear that there are a number of surprises in store for us. 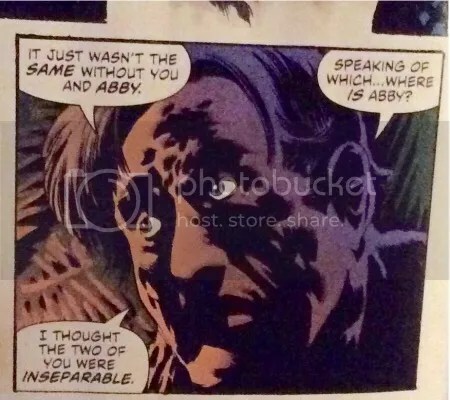 Above, Cable mentions that Abby and Swamp Thing were inseparable. I’m not quite sure what timeline is being referred to here. 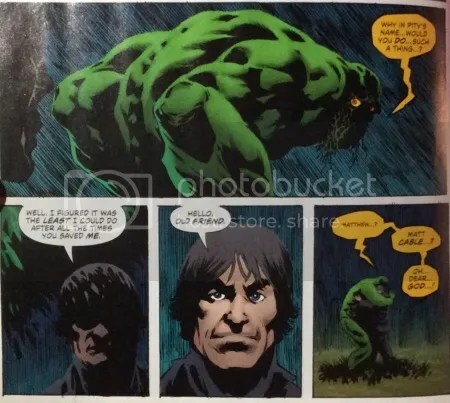 In Wein’s interview with DC All Access he mentioned, “I wanted to go back and do my Swamp Thing”. 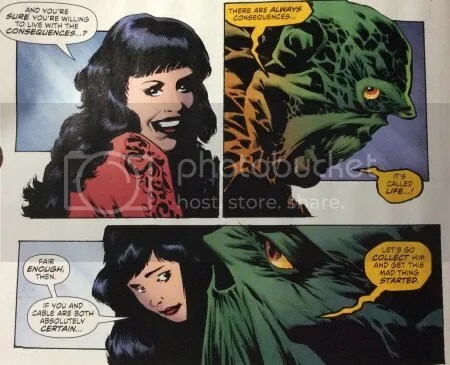 Abby and Swamp Thing weren’t an item until Moore took over. I’m sure we will hear all about the “complicated” details in future issues. 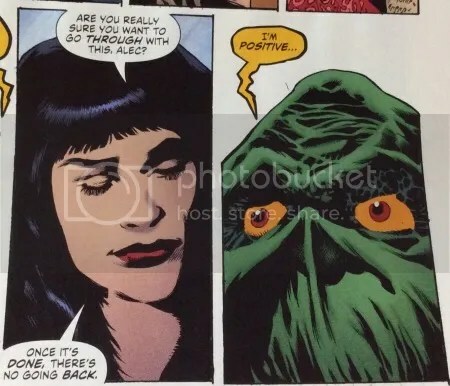 Cable tells Swampy that he has devoted his life to help Swamp Thing return to his human form. I’m sure you recall series 1 and the guilt that Cable felt when he realized the monster he vowed revenge upon turned out to be Alec Holland. Cable mentions his world travels in finding a solution. There are some pretty cool cameos featuring, Mister E, Felix Faust and Enchantress. 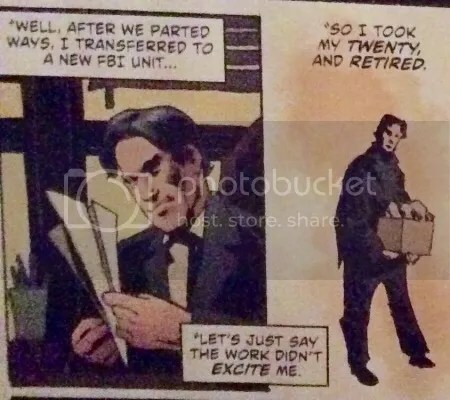 Meanwhile, back in Houma, sheriff Fox continues to deal with the dirty work from issue #2. 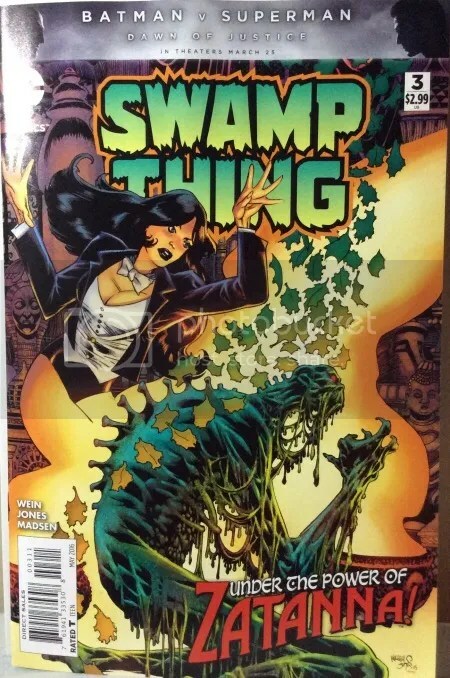 As the cover depicts, Swamp Thing convenes with Zantanna at Shadowcrest. 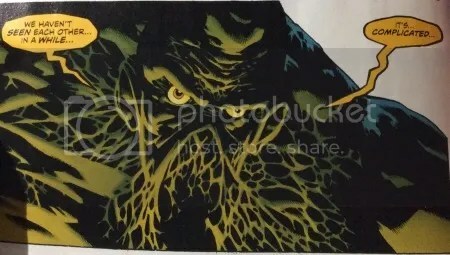 Swampy strikes a pose, only to be rivaled by Zantanna’s humongous portrait. 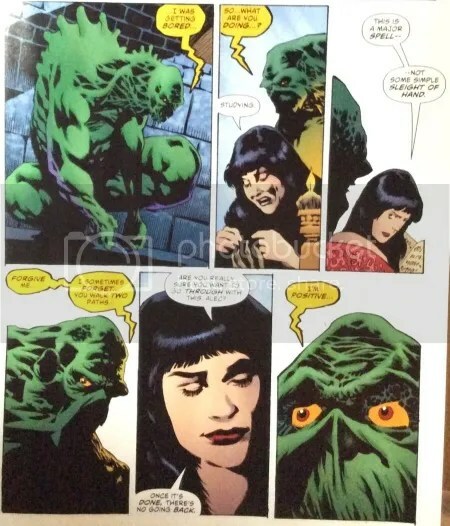 …and quadruple checks to be sure Cable and Swamp Thing want to proceed. 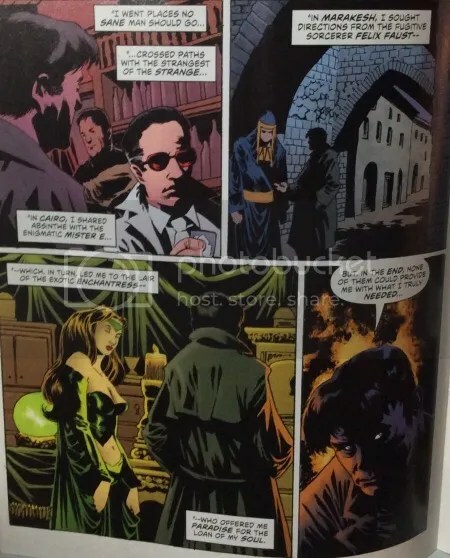 Almost two pages are eaten up by Zantanna asking them if they are sure. I understand this may have been used to setup the big reveal at the end but it was a bit distracting. 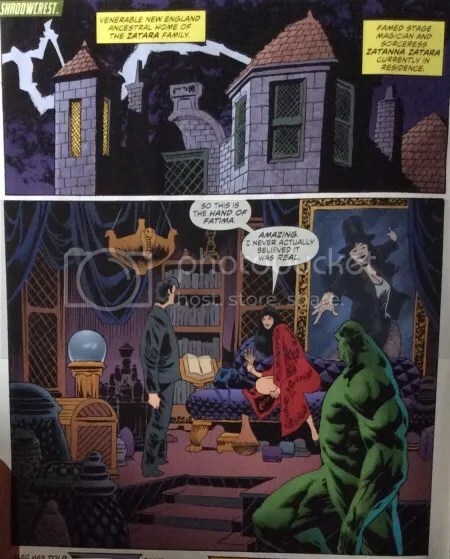 Again, Kelley Jones’ work is spectacular! 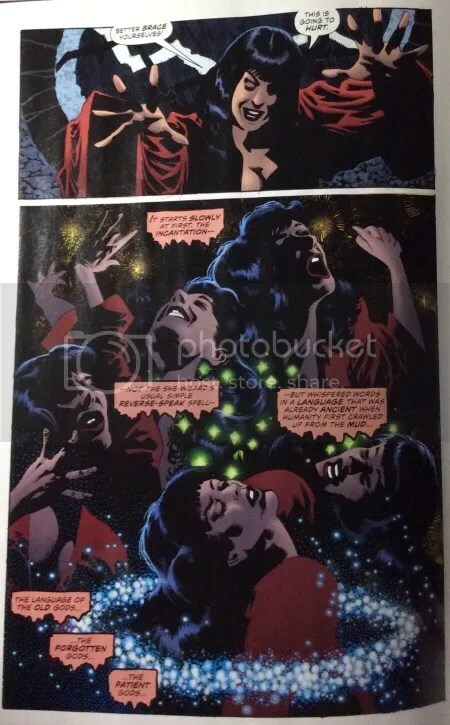 The montage-like splash, below, is such a vivid depiction of Zantanna’s ritual. I love this page. It’s a wonderful scenario, blurring ecstasy and agony. I’ve enjoyed this mini-series so far and am excited to see what the next three books hold. I thought the series would start with more of a bang. So far it feels like a slow unraveling, which would be wonderful for an ongoing series but for a six book mini I’m a bit concerned. I have high hopes that, although it didn’t start with bang, it will end on one. Some interesting characters have been mentioned and odd scenarios presented. I have no doubt they will culminate for a spectacular finale.